The Feast of the Black Nazarene takes place Saturday, January 9, 2016. Watch the event as it happens live from Manila via this streaming video. 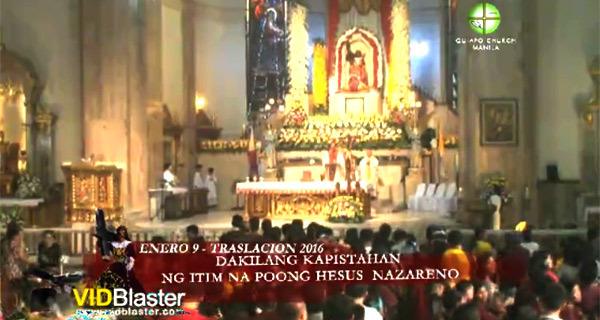 The website of the Quiapo Church stressed out that the livestreaming feed is "not a substitute" for the actual Mass. "Parishioners still have to attend masses in their Churches," a post on the web portal states. "Live streaming was setup for those who, due to their illness, could not go to Mass; or those who, due to their locations, do not have Churches to go to." "Those who already went to mass may also view the live streaming, especially our devotees, to nourish their faith and devotion," it added. Millions of devotees flocked to the Philippine capital to participate in the annual "traslacion" or the procession of the religious image of the Black Nazarene, beginning from the Quirino Grandstand to the Quiapo Church. The procession starts after a religious service at 6 in the morning. The mulatto image of Jesus Christ is expected to reach the Minor Basilica around midnight on Saturday or just before dawn on Sunday, January 10, 2016.